This entry was posted on Monday, March 15th, 2010 at 11:19 am	and is filed under Class Action Information, Corporate, Legal, Medical. You can follow any responses to this entry through the RSS 2.0 feed. You can leave a response, or trackback from your own site. I’m a retired Marine, Me and my family was stationed there in 1981 to 1990, I have recently been diagnosed with cancer, I don’t which type right now because I just tested positive on my Biopsy, I start CT and Pet Scans tomorrow to see where it is located. A friend told me about this sight and said I should contact you. after leaving camp lejeune in 1982/1983 i was shipped to the marine barracks at the naval base in groton ct. I developed a very violent temper after leaving lejeune and didnt understand why.. I also know of a marine that commited suicide while at the base for no apparent reason. I was always getting into trouble for psycological reasons. My family and I resided at Tarawa Terrace from approx. January 1965 thru February 1966. Please let me know what I have to do to participate in a class action lawsuit. Thank you. class action camp lejeune toxic water.i was station at camp lejeune from 1974 to 1975 1/2 soon after that my wife had several miscarriges . I have documentations in my USMC medical record stating that I had been to sick bay about 38 times beingtreated for colds,sore throat,burning eyes,headaches,skin infections,chest pains,bronchitis,viral syndrome & sinus trouble, could this have been a result to being exposed. my fatherinlaw has possibly been affected. who. how, where, when. need clarification on the process. my fatherinlaw was there and is extreamly ill.
How do I register for the Class Action lawsuit concering contaminate water at Camp Lejuene, North Carolina ? My family and I lived aboard Camp Lejeune, at this time. How do I register for the lawsuit? Thank you for your time in this matter. I was stationed at Camp Lejeune, N. C. during this time (1979-1981). While stationed at Camp Lejeune, I became pregnant and had a miscarriage. Please contact me in reference to how I can register for this lawsuit. Thanking you in advance. I was sent a letter by the ATSDR which I received in the mail on Friday, August 26, 2011 regarding my brother, Mark Rocco, who served in the USMC during the time the water contamination was rampant at Camp Lejenue. Mr. Rocco was diagnosed with an oligodendroglioma of the brain in 1998 and died in October of 2009 when there were no other treatments available to treat his brain tumor. Please notify me if my family can be part of the class action law suit. Mark Rocco has a surviving daughter who is 18 years of age. i as stationed at camp lejeune n. c. in 1984 and was hospitalized while there, how can i register for the lawsuit? than you in advance.. I grew up there in my childhood. I had a broken leg there in my childhood. My father was stationed there. So the whole family drank the water, bathed in it.. swam at the pool there. I was born in 59.. I remember being there in elementray school but thats all.. how do I get in this and prove we were there during the time frame talked about? I was stationed on Camp LeJeune from 1981 – 1982. My eldest daughter was conceived while I was stationed there and I gave birth at the end of December. In September 2010, she was diagnosed with breast cancer at the age of 27. Had radical mastectomy and subsequent chemotherapy. No history of breast cancer. I was stationed at Camp Johnson in 1982. Am I eligible to sign up? I was born at Camp LeJeune and so was one brother and one sister lived there til I was three, not sure where we lived.any ideas if we would qualify or how to go about finding info. I lived in and on base housing from about 60 to about 84 and swam quite a bit at Hadnot Point pool and worked there,too. I worked at Terrarwa Terrace I and II for about a year demoing housing. I was 33 and diagnosed with Chron’s very servere case and I have Macular Degeneration at 49 in one eye and had two major surgeries through my abdomin. So much suffering and I am thinking it has to do with the years and years of exposure to the water, with no history prior to this in my family. Please advise me if you will. I was stationed at Camp Lejeune from 1976-1979. I have not been diagnosed with any form or cancer but I do have several health related issues. i was born on camp lejeune in 1978 my mother lived in tt while she was pregnant with me she took good care of herself she didnt smoke she has never drank …but she did drink the water at the time i was born people didnt drink bottle water …she did not know the water was contaminated ….i was born with a birth defect which has caused me to have thousands of blood clots in my legs and stomach and has almost completely destroyed my legs.it took many years and many doctors to figure out why my legs had so many unhealing wounds and why i got so many blod clots.. the military started to send me mail about the water about 10 years ago….it has destroyed my life i always wondered why i was the sick one and my other sisters came out fine …..now i know ty marine corps guess that was my dads payment for doing 28 years and doing 3 tours in viet nam …. I was stationed at Cherry Point from 1986 to late 1987 and frequently traveled to and worked at Lejeune, especially following a car accident in 1986 where I received treatments for back and hip problems. Since I was medically discharged in 1988 I have had a number of medical issues, including two heart attacks, a mini-stroke, and have had anxiety issues that required me to take a number of medications. After I was born in 1983, my father was stationed at Camp Lejeune. We lived on base from 1983-1985. At 11 years old I was diagnosed with Graves disease and had to have my thyroid radiated. It is uncommen for someone that age to be diagnosed with Graves. In addition to my thyroid disease, my mother and my father were diagnosed with it as well. My mother has suffered from tumors in both her legs and she also had tumors on her uterus and had to have a hysterectomy. my husband did his bootcamp at camp lejeune, he had heart diesise,lung diesise,plus many other health prombles. he passed on 3years ago from service connected illness. am i intiled you join this class action lawsuit? PS; I have become 60% disabled by the VA for a back injury from Viet Nam and for PTSD, artheritis, fybromiliaga, migraine headaches, insominia, sysmatic heart disease, severe depression, undergoing current medical and physocialogical care at the FT MYERS VA OPC. I also filed for additional disability rating for the water contamination and have been denighed by the VA.
4 of my 6 sisters lived in Camp Lejeune from 1956-1958. The four of us have cancer, colon, breast, uterine, kidney disease, skin disorders, malignant melanoma and more. My ex husband and I was station at Camp Lejeune from 1971-1973 we had our son there, I had a miscarriage and for the past 20 years I have been battling colon surgeries,stomach problems with pain, joint pain,dizziness, headaches, hernia surgeries with lost of my navel and Legions on my lungs and I have never been a smoker. I was stationed at Camp Lejuene from Nov. ’85 to Nov. ’89. I was diagnosed with breast cancer five and a half years ago, had a bilateral mastectomy. There is no breast cancer in my family history. Would appreciate information regarding the class action lawsuit, and if I am elegible. My husband and I were both stationed at Camp Lejeune in the 60’s and exposed to the contaminated water there. I was of childbearing age at that time and after discharge had two children. I have autoimmune disorders: degenerative disc disease, autoimmune hypothyroidism, GI diverticulitis and gastritis with biopsy showing metaplasia. My daughter and grandson also have autoimmune disorders. We have positive ANA’s to mark the autoimmune response. We would like to join the class action on behalf of ourselves, our children-now grown-and their children. We were stationed at Camp Lejeune from 1984 to 1988 before that Cherry Point and after that Camp Pendelton. My understand as they all have water issues. My family and I all have some kind of issues. To much to go into right now. I was stationed at Camp Lejeune from 1990 – 1993. I suffer from a reoccurring skin rash for which my family doctor nor the VA have any answer. My 19 year old daughter, who was born during this time and spent time on the base as an infant, has just been diagnosed with abnormally large cysts in her breasts. Please send me more information on this case. Thank you. My husband (now deceased) died of cancer in 2007. He was a marine and we were at Cherry Point from 1965 – 1966. The doctors did not find the primary site of his cancer. He didn’t know he had it until it had already taken over his liver, one kidney, and into his lungs. My thyroid became overactive, diagnosed in 1985, and was treated with radio active iodine to destroy it. Does the water contamination also include Cherry Point residents? Please advise. How do I become a part of this class action suite. I was at Camp Lejeune from 1970 to 1972 I have a lot of health issue. I was stationed at Camp Lejune in 1965, have suffered a heart attack, and various skin cancers. I received 2 letters from ATSDR about contaminated water @ Lejeune. I have been affected. How can I join the class action suit? We were moved from Midway Park over to Terrible Terrace II in 85. We called base housing about the roaches and the water serveral times to be told the water was fine. It was so obvious the water was bad, especially hot water would foam and the smell of dry cleaning chemicals were too strong to ignore. We couldn’t use it to cook, drink and for laundry we went to a laundrymat. Kept gallons of water in house. My wife called a civilian water testing company and they refused to test the water as we were on a Federal Property. Next float coming up within next few months. Instead of my wife staying there with the water and bugs, she moved out and we gave up base housing. For the next 20 years we never lived on base again. I have heart problems – only one in a family with 4 boys and one girl. My wife has breathing problems and was hospitalized several times while living there. They knew the water was bad and so did the civilians that didn’t want to test and step on government toes. hoe do i get info on how to file due to thecontamination at camp ;lejuene nc. i lived there with my family from 1972-1979. my father was stationed at there and was usmc. I want to register to be a part of the class action law suit for contaminated drinking & bathing water consumption while stationed at Camp Lejeune, North Carolina for 4 weeks each in 1966 & again in 1967, during my pre-deployment combat training prior to deployment to Danang South Vitnam at Red Beach & subsequently to Happy Valley outside of Danang, near Marble Mountains, while attached to MCB 1- US Naval Mobile Construction Battalion Number One. How do I register for the class action lawsuit in regards to the contaminated water at Camp Lejeune. I was stationed at Camp Lejeune in December 1975 thru May 1976. I do no have cancer, but I have other related medical issues. Am I eligible for medical or monetary benefits? Later my family moved to Jacksonville, NC while I was stationed at Camp Lejeune, are they eligible to join class action lawsuit? I am very concerned…? 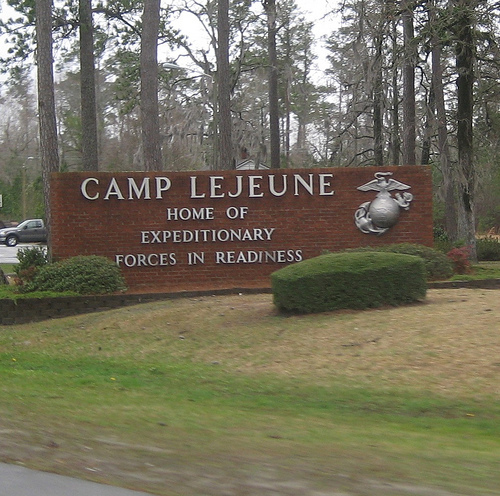 I was stationed at LeJeune 1970-71…my ex-wife died recently from cancer…she was with me for 10 months at Lejeune..? what is my next step..? I would like to join the class action law suit and need a attorney. We lived in base housing at New River Air Station, Camp LeJeune, and my youngset daughter has several medical problems, and am wondering what to do to determine if any of it is related to this law suite for contaminated water. I was contacted in 2000 and gave a phone interview about her med. history and when we lived on base, etc. but have never received any further correspondence from them. Thank you for any help. My father was stationed at Camp Lejeune in the early 1980’s. I was not born until 1988. My father died in May 2000; he was only 38. I had Scarlet Fever at a very young age which shut down my right kidney and it had to be removed. I also have a Pulmonary Valve Insufficiency disorder. I would like to join this class-action suit and I need an attorney. Please help me, I just found out about the class-action suit and I do not have a clue how to go about seeking legal assistance. I was born at camp lejeune in oct 66 with mild spinabifida. I am currently 100% disabled, with all kinds of health issues I never understood until I heard about the contamination last month. I cant believe the Marine Corp never contacted me. The Marine Soldiers always deal with the dead and wounded. How dare the Corp disrespect the tradition! 2010 i was diagnosed with lymphoma stage 4 cancer..
My father was a marine stationed at camp lejune with my mother during the sixties.I had been born with birth defects to my leg and foot in 1967.my father passed away in 2009 from leukemia after beating lymphoma cancer.my mother also suffers from severe rumetoid arthritis.I am wondering if there are any benefits my mother and I could apply for.Thank you. I was married to a US marine and we moved to base housing Tawara Terrace.When I got pregnant with twins we moved to base housing on Camp Lejuene. I had surgery after my delivery and had a mild infarction. I was told that the surgery went well except for that happening on the operating table. I later moved from Camp Lejuene and had a heart related episode which was called idiopathic cardiomyopathy (heart attack from an unknown orgin). I was there when the water was contaminated for about 5yrs, 1987-19921..How do I apply for that class action suit. My family lived on Camp Lejune in the 70’s. My father died from a massive heart attack on the USS Nassau at the age of 42. My mother has battled cancer 4 or 5 times having surgery yesterday to remove spots on her liver. My sisters and I have had health issues over the years. All of us have bone density issues that are not genetic. Thyroid, vision, precancerous cells, miscarriages etc. Any information would be greatly appreciated. How do I find out about or sign up for any class action suit related to this. I was born in Quantico VA. at the military base in Dec 1967 and spent the first 2 years of my life at Camp Lejeune. I spent most of my life dealing with fatigue issues and still do as a result of Sarcoidosis. I also developed a distinct bowing (about 20 degrees or more) of my right arm that wasn’t present when I was born but appeared while being nursed by my mother while at the camp. I tried to use the contact form at Anderson Pangia but it sent me to an error page. Maybe its full or something? I left a phone message with them on 4/9/13 we’ll see what happens. Back in 2000 I contacted the other law firm. I have no idea if they added me or just forgot about it after they hung up the phone so we’ll see if the Pangia folks contact me back. Anyway… I wanted to get put on the action list. MY dad was stationed at Cherry Point 1961- 1966. During this time my sister and myself were conceived. As an infant I was hospitalized with severe projectile vomiting, my sister was born prematurely, has a large birthmark on her lower back, had an umbilical hernia surgery at age three, had eczema and asthma. Her daughter doesn’t have enough enamal on her teeth, and both of her kids have severe asthma. My mother has suffered from fibromyalgia , thyroid and adrenal issues. My dad was just diagnosed with bladder can er two years ago, which has not reoccurred, he is now showing signs of dementia. Are there water issues in Cherry Point? Many of the symptoms showing up at Camp LeJeune sound familiar. Are we eligible for the class action lawsuit ? My family was stationed at Camp Lejeune, Tarawa Terrace, ’64 – ’66, I was between 3-6 years old. In 1988 I was diagnosed with Lymphoma, 18 months of chemo followed. I still have Neuropathy. My Mom had breast cancer surgery last year. Count me in! If eligible, I would like to join this suit. We were stationed at Camp LeJeune and lived on Tarawa Terrace July 1987 to February 1989. I realize this was at the end of the time frame of contaminated water but my husband is suffering from rectal cancer and is now in stage 4. I also had thyroid cancer in 2010. Count us in. I was stationed at Cherry Point and did my MOS training at Camp Geiger in 1987 are those of us that trained by LaJune at Camp Geiger included in this case? I suffer from headaches and have twins born 12 1/2 weeks early who suffer from Ceribral Palsy ( C P), suffered strokes when they were born and my son has had3 brain surgeries. please contact me to discuss. I was stationed in Camp Lejeune from 1985 to 1989. I was diagnosed with Hepatic Steatosis. I was a Hospital Corpsman at Camp Lejeune from Aug. 1979 to Feb. 1982. Spent most of the time at the Naval Regional Medical Center on Hadnot Point. I was diagnosed with esophageal cancer in April 2012. I just found out about this.I was station on New River in HMT 204 but lived in base housing on Lejeune in 1977. I would like to get this service connected with the VA in Oklahoma to draw some kind of a precents and file with class action or by myself. My father was stationed at Camp LeJuene during his enlistment and I was born there in 1955. My brother was born there in 1952 and my sister was born there in 1958. My father died in 2010 of Lung Cancer and my sister has had breast cancer. I want to know how to get registered for the class action case I was stationed at camp Lejuene fron 1982 to 1984 I have been diagnosed with a heart condition that is on the list of deseaes I have applied for va health bennies but was admisterated discharged not sure what will happen nexr no health insure for care what if I have other issues how do I get diagnosed? Was at midway point in 1971 and 1972 spent all my time on base when my x husband was on manovers. I took classes in swimming,sailboating,etc. I now have many health issues and I am being treated for Lupus. I had two misscarraiges,one in 72 and another in 74. How do I file for class action lawsuit? I have had un-explainable multiple surgeries for bladder and prostate cancer at an early age. I was stationed as a Marine aboard Camp Lejeune during the effected years.What happened to “we take care of our own”. USMC Active Duty 4/4/76 to 4/4/80. Married.Two children Born at the Hospital in town. Worked on base and drank the Contaminated water. Registed ATSDR, US Dept of Health and Human Services. Havn’t heard a word else wise. Stationed at Camp Lejeune in the 80s. Lost right kidney due to Kidney Cancer. How do I add my name to a class action lawsuit? I WOULD LIKE TO JOIN THE CLASS ACTION LAWSUIT FOR THE CONTAMINATED WATER. ME AND MY DAUGHTER AND 2 OF MY GRANDSONS HAVE SEVERE PROBLEMS. my eldest sister died at the age of 43 of aggressive stave 4 breast cancer. She lived in Jacksonville/Camp Lejune in 1989 until 1991. Please tell me how I can get in this lawsuit for her. I WAS AT CAMP LAJEUNE IN AUGUST 1968 UNTIL NOV 1968 HAVE A CHILD WITH ADHD I HAVE HAD AFIB WHICH LEAD TO A STROKE. CANT FILE WITH THE VA BECAUSE THE MARINES WONT SEND ME MY RECORDS CANT GIVE THE VA MY DD FORM 214 DOCTOR NAMES AND DATES THAT I WAS TREATED FOR BAD WATER EFFECTS DUE TO THIS AND THE MARINES SAY THEY TAKE CARE OF THEIR OWN, YA WHAT ARE THEY WAITING FOR ALL OF USE TO DIE SO THEY CAN LIE TO CANGRESS AND GET MORE FUNDS. I WAS STATIONED AT CAMP LEJEUNE 1981 THRU 1983 WITH FAMILY. I WOULD LIKE TO JOIN CLASS ACTION LAWSUIT. My ex-husband and I were stationed at Camp Lejeune in 1969-1970 and then 1976-1978. I had 2 miscarriages, in which I almost died, have been diagnosed with multiple diseases. My daughter has had 2 miscarriages and is very anemic. She has to have blood transfusions a year. We would like to know how we can be include on this class action lawsuit. thank you. I was born at Lejeune in 1956, and live there for the first several years of life. My mother has passed from cancer. My grandfather who was stationed there has passed. He served at Lejeune 5 times before retiring in 1968 from Lejeune. I have had 3 miscarriages, chronic migraines, chronic fatigue syndrome, thyroid problems. If I can be include in a class action suit please let me know. I WAS STATION IN CAMP LEJEUNE FROM JANUARY TO JUNE 1968. PLEASE INCLUDE ME IN THIS CLASS ACTION SUIT. I HAVE HAD MULTIPLE HEALTH PROBLEMS SINCE THEN. This site is for information only. We do not sign people up for lawsuits. Thanks. my parents had lived on the geiger trailer park on the base. I myself was born on the military base in 1973. My father was an mp there at that time..I was wondering if this could have effected me as a child whose breast bone didn’t develope right and also other possible effects.how can I find out more info on this lawsuit? I am a Marine veteran that was stationed at Camp Lejeune,N.C during the 70’s. I would like to register for the contaminated drinking water class action lawsuit. How do I do this? I am already registered with the United States Marine Corps registry for the contaminated drinking water issue. Thank You for any help you may be able to provide! I am a veteran of the U.S.M.C. who was also station at Camp lejune during the late 70’s early 80’s. I do not think I affected how ever I have a son who was born with a severe case of eczema. In fact he may have cancerous sores. I am not on the United States Marine Corps registry for the contaminated drinking water issue nor the register for the contaminated drinking water class action lawsuit. How do I do this also? Please use my email address for contact. Thanks in advance. Hi,my husband was station in Camp Lejune during the 70’s. He was a veteran of the U.S.M.C. He was diagnosed with mulitiple myeloma cancer in 2001, He died October 13, 2002. I am register on the United States Marine Corps Registry, but not the lawsuit. Please let me know how I would go about signing up for this lawsuit. Please use my email address for contact. Thanks in advance. My ex-husband and I lived were at Camp Lejeune 1968-1971. Our two daughters were born at the Lejeune Naval Hospital.I have was diagnosed with a rare form of Vasculitis; with a history of two bypass surgeries, multiple stents, angioplasty, and severe depression. One miscarriage four months after my husband was released from the Marine Corp; I became permanently disabled in May, 1988. My younger two children are now both permanently disabled; my oldest daughter suffers from depression. Could you please send Information needed to be included in this suit. My father was enlisted in the Marine Corps and was stationed in Camp Lejeune. My father and mother lived in Tarawa Terrace from 1959-1963. My mother died of a rare disease called Pulmonary Fibrosis 10 years ago at the age of 66 and we just lost our father a few months ago from a rare disease called MDS (which I never heard of until then). I read upon these diseases and both diseases said it could of been cause from being exposed to certain contaminations. I would like to register for this Class Action Lawsuit for Contaminated Water is USMC. was on vacation travelling home when I became very disoriented.complained to my sister who called the corps,they told me go to Brooklyn navy yard,from there to Philadelphia, walter reed and back to camp Lejeune.diagnosed as having condition prior to service.was at camp Lejeune from 1984 to 1985. I feel I was kept from important information that now may bring answers to why I have, my father has, and sister, mother have illnesses unexplained. Thank you for helping “us” find the answers , honesty and help we deserve. I was at Paris Island starting Jan.25th 1966 . After boot camp went to Camp Lejeune for the remainder of my Enlistment. During my time at Camp Lejeune, i was sent T.A.D. to Cuba for 6 months. After the T.A.D. to Cuba, returned to Camp Lejeune to finish out my Enlistment in 1968. I was stationed at Cherry Point and also spent 4 months in the Hospital at Camp Lejune with a broken leg. I was stationed there from 1961 to 1963. I just found out about this law suite and the possibility of filing a claim. Over the years I have had surgerys for skin cancer. Further I have had problems with muscles causing me to take medications for the problem. I would like to know what I have to do to apply for me to be a part of this law suite. I was station at Camp Lejeune from late 1984-Aug,1986. Around 2011 I found out that I have Cirrhosis of the Liver. I started going to a Gastroenterology which has done a lot for me. After having a biopsy he informed me that I had been sick for over 25 years, I am still working my liver level is 571.5 and praying that I will never need surgery. The Government is so full it that I ask nothing from them, they say LEAVE NO-ONE BEHIND so not true. The Men & Women that was willing to RISK their LIVES are Forgotten. I waas stationed at camp LeJeune from 1975-1977 and the returned in 1979 for EOD school. I have a long list of problems. I have had colon cancer inwhich case the VA took 3 feet of my colon out.The VA also siad there was a chance of it being a result from Camp LeJeune. The following 2 years I had precancer in the colon. Possible prostsate cancer. The first biosy came up where they wernt sure so now I am waiting the the new results.Now being able to go through my medical records I have found out a lot more the the VA has found out but never told me or they have just found out because of my persitance in finding out what was ailing me. Depression, Verigo, Tinnitice, hypertension,sleep disorder,B-12 deficiency, migrains, gerd, pstd, short term memeroy loss, cyst in the liver, cyst in the brain, loss of white matter around the brain, behavioral disorder, fatigue,nerve damage,hearing loss. Degenitive disc desease in the lower back and neck.These all were found by the VA at different times starting around the year 1997. I got out in 1986 and did not bother with the VA to much at first but it took 7 years to get my first claim setteled for my knee and wrist which was service connected. How do I get involved my brother was born there in 1957 I was conceived there but I was born in Quantico Va.1958, My dad spent numerous years there as a Marine, he had 3 tours in Viet Nam but both my parents died of cancer my mom died in 1989 my dad 2008 also my brother has some birth defect we where exposed to all of the military growing up my dad spent 21 years in and I also spent 8 years in the navy Seabees so any info would be heipfull thanks. I lived on base with my marine husband and my little girl who was just a toddler from 1989-1993. My husband all of the sudden was showing signs of mental illness. He had never shown signs before. I became pregnant with my son while on base, delivered him on base and stayed on base until he was 10 months. He was born with a severe and rare birth defect. They would not diagnose him, the doctors on base just kept telling me not to worry about his deformities and that he was okay. I moved off base to Idaho where the doctors diagnosed him the day after I got here with a life threatening birth defect and he had to have his entire head reconstructed. I was diagnosed with cancer several years later. Please help. My husband was in the Marines during Jan 6,1970-Jan 6,1972, where he was station at Camp Lejune. He was diagnosed with multiple myeloma cancer in 2001,and he died in October 13,2002,with carpulmonary arrest,which he suffered with renal kidney failure,and cause of death was contribute cause of multiple myeloma cancer. Please help me.